To help you with your search, browse the 4 reviews below for assisted living facilities in Owensboro. On average, consumers rate assisted living in Owensboro 4.0 out of 5 stars. Better rated regions include Newburgh with an average rating of 4.4 out of 5 stars. Caring.com has helped thousands of families find high-quality senior care. To speak with one of our Family Advisors about assisted living options and costs in Owensboro, call (855) 863-8283. Nestled on a scenic bend of the Ohio River, Owensboro is Kentucky’s fourth-largest city. Aging seniors in Owensboro can choose from three assisted living facilities in town, with another two assisted living communities in the nearby towns of Newburgh and Boonville. Residents in assisted living facilities receive not only room and board but also help with personal care, medication management and the activities of daily living, which include dressing, grooming and bathing. Kentucky's Department for Aging and Independent Living certifies all assisted living communities in the state every year. Weather is variable and windy in Owensboro, with cold winds from the north and warm ones from the south alternating at any time of the year. Winters do bring snow, but it doesn't tend to last long. Look for hot, humid summers with thunderstorms. The cost of living in Owensboro is 15.3 percent below the national average, making it a budget-friendly choice for seniors. People from all over Kentucky flock to Owensboro for its many festivals. The International BBQ Festival holds a competition to let guests taste the best, and the Owensboro PumpkinFest is a fundraiser that celebrates autumn fun. Music festivals that attract people of all ages include the River of Music Party, the Lanham Brothers Jamboree, and Friday after 5, a series of summertime concerts held along the river downtown. The Owensboro Transit System provides bus service around the city. Those with disabilities can get door-to-door service via the Green River Intra-County Transit System. The Owensboro area is home to world-class medical facilities, including the Owensboro Health Regional Hospital, in the event of medical emergencies or illness. Owensboro has an array of community resources for seniors, including the Green River Aging and Social Services Department, an organization that provides help with Medicare and Medicaid plus advocacy for elder abuse and other legal issues, as well as two senior centers. Assisted Living costs in Owensboro start around $0 per month on average, while the nationwide average cost of assisted living is $4,000 per month, according to the latest figures from Genworth’s Cost of Care Survey. It’s important to note that assisted living rates in Owensboro and the surrounding suburbs can vary widely based on factors such as location, the level of care needed, apartment size and the types of amenities offered at each community. 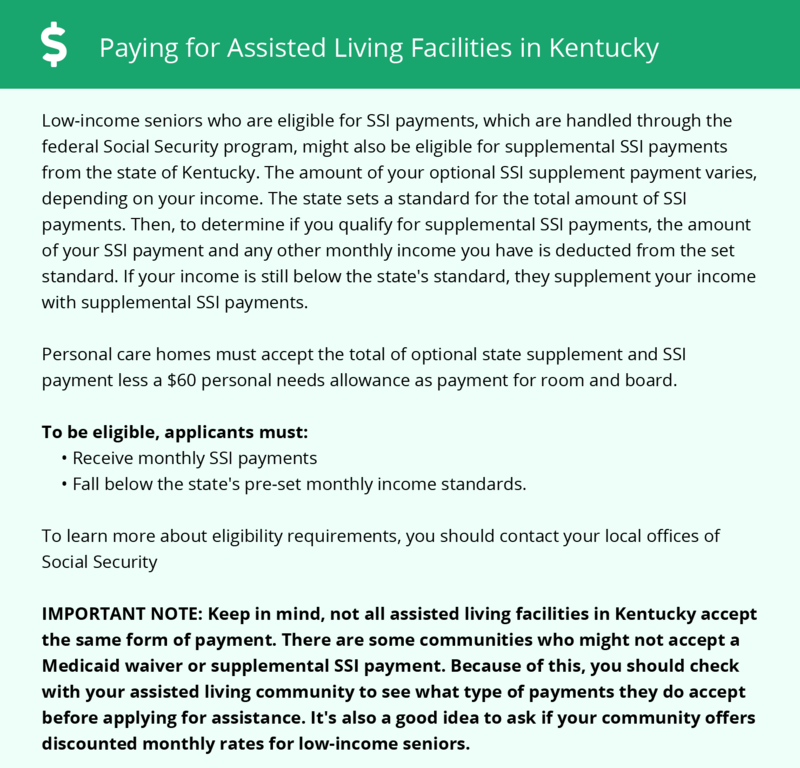 Eligible seniors in Owensboro may qualify for financial assistance to help pay for their assisted living costs through Kentucky's Home and Community Based Services Medicaid Waivers, although this program typically has a waitlist. Veterans who meet qualifications may be able to get assistance through the Veterans Administration's Aid and Attendance Program. Owensboro and the surrounding area are home to numerous government agencies and non-profit organizations offering help for seniors searching for or currently residing in an assisted living community. These organizations can also provide assistance in a number of other eldercare services such as geriatric care management, elder law advice, estate planning, finding home care and health and wellness programs. To see a list of free assisted living resources in Owensboro, please visit our Assisted Living in Kentucky page. Owensboro-area assisted living communities must adhere to the comprehensive set of state laws and regulations that all assisted living communities in Kentucky are required to follow. Visit our Assisted Living in Kentucky page for more information about these laws.